[114 Pages Report] Flotation Reagents Market is projected to grow from USD 3.93 billion in 2017 to USD 5.55 billion by 2023, at a CAGR of 6.0% between 2018 and 2023. The flotation reagents market across the globe is driven by their increasing use in water & wastewater treatment, explosives & drilling, and mineral processing applications. The base year considered for the study is 2017 while the forecast period is between 2018 and 2023. The main objective of this study is to define, describe, and forecast the flotation reagents market on the basis of type, application, and region. 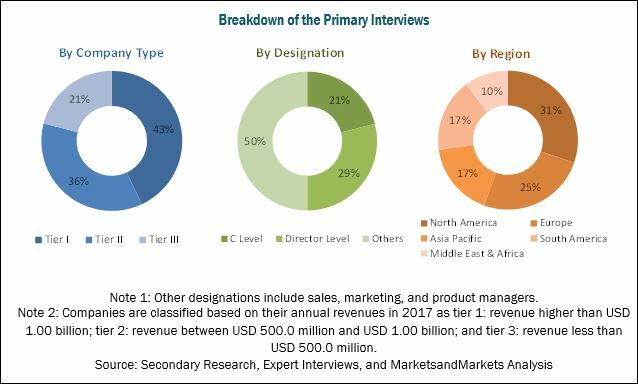 The report includes detailed information about the major factors such as drivers, restraints, challenges, and opportunities influencing the growth of the flotation reagents market. This report strategically analyzes different segments of the flotation reagents market with respect to the individual growth trends, future growth prospects, and their contribution to the overall market. Based on type, the flotation reagents market has been classified into flocculants, frothers, collectors, dispersants, and others. Based on application, the market has been classified into water & wastewater treatment, explosives & drilling, mineral processing, and others. The flotation reagents market in APAC, Europe, North America, the Middle East & Africa, and South America has been studied, and its size has been estimated, in terms of both, value and volume. Both, the top-down and bottom-up approaches have been used to estimate and validate the size of the flotation reagents market and to estimate the size of various other dependent submarkets. Extensive secondary sources, directories, and databases such as Hoovers, Bloomberg, Chemical Weekly, Factiva, the Organization for the Economic Co-operation and Development (OECD), the World Bank, the Securities and Exchange Commission (SEC), and other government and private websites have been referred to identify and collect information useful for this technical, market-oriented, and commercial study of the flotation reagents market. Some of the major players operating in the flotation reagents market are BASF SE (Germany), Cytec Solvay Group (Belgium), Clariant AG (Switzerland), Kemira OYJ (Finland), Huntsman (US), Dow Chemical (US), AkzoNobel (Netherland), SNF FLOERGER SAS (France), Evonik (Switzerland), and Orica (Australia). This research report categorizes the flotation reagents market based on type, application, and region. A product matrix, which gives a detailed analysis of various types of flotation reagents used in various applications. 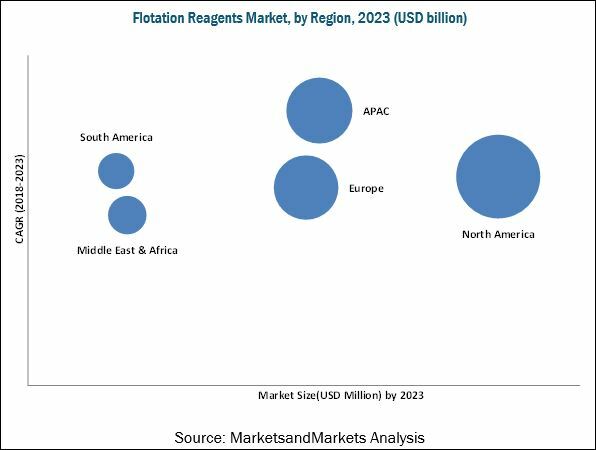 The flotation reagents market is projected to grow from USD 4.15 billion in 2018 to USD 5.55 billion by 2023, at a CAGR of 6.0% from 2018 to 2023. The market has witnessed significant growth in the recent years, owing to the increasing investment in mining projects in APAC and South America. Rapid industrialization and urbanization in key countries such as China and India have spurred the demand for metals and minerals in the past few years. Based on type, the flotation reagents market has been segmented into collectors, frothers, dispersants, flocculants, and others. The flocculants segment is expected to have the highest share in the flotation reagents market in 2018, in terms of value. The growth of this segment can be attributed to their increasing consumption in a variety of mines and mineral processing plants, ranging from coal to base and precious metals. Based on application, the flotation reagents market has been segmented into explosives & drilling, mineral processing, water & wastewater treatment, and others. The water & wastewater treatment segment is projected to lead the flotation reagents market, in terms of value during the forecast period due to the increase in demand for freshwater and stringent environmental regulation. The flotation reagents market has been studied for North America, Europe, APAC, the Middle East & Africa, and South America. The APAC flotation reagents market is projected to register the highest CAGR, in terms of value, during the forecast period. The growth of the flotation reagents market in the region is primarily due to the rapid expansion of economies which is attracting huge investments from global mining companies, hence driving the market. The APAC region is witnessing high demand for flotation reagents, especially from China, Japan, India, and other Southeast Asian countries. Factors such as stringent regulations imposed by the government on wastewater treatment, and presence of vast mineral resources of copper, zinc, coal, and aluminum are contributing to the growth of the flotation reagents market in APAC. The flotation reagents market is expected to witness significant growth during the forecast period. However, slow growth of the mining industry in developed economies is expected to hinder the growth of the market across the globe. BASF SE (Germany), Cytec Solvay group (Belgium), Clariant AG (Switzerland), Kemira OYJ (Finland), Huntsman (US), Dow Chemical (US), AkzoNobel (Netherland), SNF FLOERGER SAS (France), Evonik (Switzerland), and Orica (Australia) are the key companies operating in the flotation reagents market. 10.11.9 Cochran Chemical Company Inc.
10.11.12 Yixing Bluwat Chemicals Co., Ltd.